ZANDO Designs offers a wide range of landscaping services from recommending and installing plantings to large-scale comprehensive landscape plans incorporating such diverse elements as arbors, pergolas, patios, decks, fences, lighting, irrigation, and fountains, all with the final goal of creating a beautiful, relaxing and inviting environment. 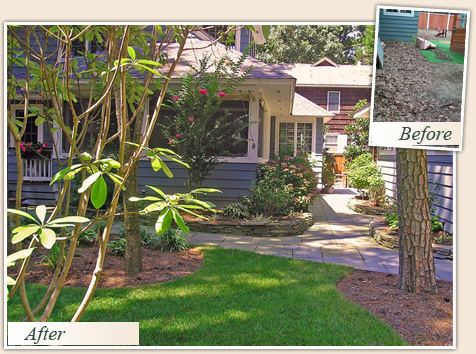 The owner of a home in Rehoboth Beach called ZANDO Designs after a major remodeling job had devastated the landscaping and rear yard. They wanted a natural setting with native and traditional beach plantings along the two street sides of the corner lot. The refurbished yard would also include flowering trees with walkways defined by stone walls and landscape lighting. A traditional bluestone walkway leads to a delightful birdbath fountain, flanked by flowering shrubs, and then on to a private dining deck. ZANDO Designs brought in large native Magnolia trees and River Birch to provide instant privacy and cool shade for entertaining. The project also incorporated landscaping, paving, decking, irrigation and lighting, all of which combined to create a stunning garden great for relaxing and entertaining. 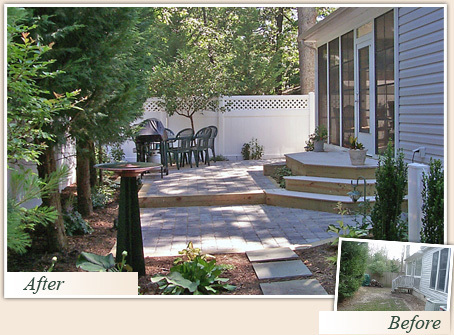 Another Rehoboth homeowner wanted to upgrade what she called “a standard builder’s package” landscape. She hired ZANDO Designs after seeing their work on the “Rehoboth Cottage Tour of Art”. The “corridor-like” back yard area was enhanced with a two level brick patio and the typical builder’s steps and rails were replaced with an inviting tiered rear entry deck to access the screened porch. Working with a piece of stained glass from the owners’ collection, ZANDO Designs constructed a decorative screen which now hides an unsightly utility shed. After pruning and shaping large trees and building a new fence, low-maintenance shade loving perennials and ground cover were planted among the stepping stones and beds. The final detail is a copper fountain with the relaxing sound of flowing water.